Well, I did it. I waited until the Playstation VR bundle went on sale and I decided to buy it. I’ve been wanting to play VR since it first came out. But, being the person I am, I didn’t want to spend all that money on it. Yes, I’ve got a job that could have paid for it, but being an adult means I’ve got bills and responsibilities. I know, boring, right. But, I must say, I’m so glad I finally did buy the VR for my PS4. I really love playing the games. I had VR worlds in with the bundle and, me being stupid, decided to start with the oceon decent. The reason I’m stupid is because it had a shark attacking the cage. And, you guessed it, I have a fear of sharks. I have never jumped so far in my life. I even had to check my legs were still there. I knew it wasn’t real, but it didn’t stop me from thinking my legs had been bitten. I also brought Star Trek: Bridge Crew to play on the VR. Being a life long trekkie, having the chance to be in charge of a starship was like a dream come true. There I am, sitting in the captain’s chair, wearing command gold and telling the bridge officers what to do. I loved it. I’ve brought some other games for it, including job simulator and surgeon simulator. I’ll be doing a review on these games soon. But, if you want to be immersed in game play, I would definitely recommend the VR. You actually like you’re in the game, rather than just playing it. It really is the best feeling. Why Is This Game So Addictive? I downloaded the strangest game a few days ago. I know its been out a few years now and I’ve watched YouTubers play the game. It looked a fun and quirky game. But, I’ll be honest, the only reason I decided to purchase the game is because it was at a discounted price. And I am so glad it was. The game was released in 2015, it was published by Bossa Studios. Now, the whole point of the game to play a slice of bread and do everything you can to become toast. There are other features to the game, but lets focus on the slice of bread, becoming toast. Ok, I’m a slice of bread and my main obsession in life is to become toast. So, what do I do? Anything and everything I can to reach the object that will toast me. Only problem is, there are a number of obstacles in the way. Mould, balls of dirt/dust, ants, sweets, plates, glasses and an array of household items. Getting some of these items on the bread will lower its edibility. There is also the higher danger of falling on the floor or in water. This reduces the bread’s edibility very quickly. However, there are a number of ways to toast the bread, other than using a toaster. In the kitchen I used the hob to make toast. In the bedroom I used the iron. But my favourite was the living room. I toasted the bread using the TV. It was fun knocking the bowling ball onto it. The thing is, this game is so annoying. I try swinging the bread from the coffee table to the sofa and the thing just belly flops onto the floor and becomes inedible. Then I misjudge a gab between a box and a wall, what happens. I miraculously manage to save the slice of bread on the wall. Nothing makes sense with this game. All logic and rational thought has been thrown out of the window. I mean, why is this slice of bread trying so hard to become toast? Is a tan really that important. But, more importantly, why is this one slice of bread so desperate to make that man’s life a misery. Everything around him is being destroyed by a slice of bread. How moronic does that sound. And yet, I find myself wanting to take part in this slice of bread’s destruction. Why is it, that this game makes me want to turn it into toast, almost as much as the slice of bread wants to be toast. Could it be because the game is so annoying and rage-inducing, that it makes it a joy to play. Where did that jam come from? To make the destruction worse, I can also be a mayhem making baguette that is hell-bent on destroying everything in its path. I can race a bagel around the room, following markers along a course. There is also a fragile cracker that I can take on a cheese hunt, without destroying it. So, why can I not stop playing it? Oh well, once a gamer. Always a gamer, I suppose. I’m on holiday his week and I’ve decided to take a break from my PS4. Which is a shock, since I do love it. But, it’s not my favourite console. Nope. My favourite is actually my PS2. It’s not just the console either, it’s the games that were made for it. From my point of view, these games showed the transistion from how games were made, to where the gaming industry was heading. I know some people won’t agree with me. Others may say this console did that or that console did this. Or, everything you need to know can been seen over the years of PC gaming. We all have opinions, this is mine. The main reason I love the PS2 so much is the games. I’ve never just liked one type of game. I like action, adventure, platform, side-scrolling, simulation, strategy, casual, etc … etc. So, as a result, I have a wide variaty of games for every console I own. But the games on PS2 are different. I say this because I have found some of the most crazy and quirky games for this console. Don’t get me wrong, I know these games were also available on other platforms, but for me, it didn’t have the same feeling. Take the Gregory Horror Show, for example. I have spent hours at a time on this game. And I can guarentee you right now, that I will spend even more hours on this game in the future. It’s unorthadox, but so simple. 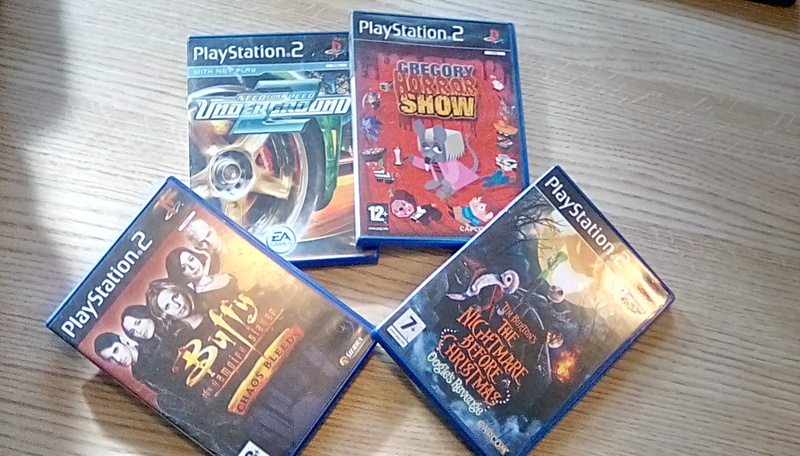 Gregory Horror Show is a survival-horror game and, as far as I am aware, the only platform it was available on was PS2. The characters were crazy, good. But they could be scary as hell. Especially Cathrine and Hell’s Chef. Being chased by these characters was one thing, but being caught, that’s another. If you ever get the chance to play this game, play it. You won’t regret it. It really is a hidden treasure. My one piece of advice, though. If you do play the game and end up being chased by the charaters. Go straight to your room. It’s the one safe place in the game. Then there’s Buffy the Vampire Slayer: Chaos Bleeds and Nightmare before Christmas: Oogie’s Revenge. Before you say it, these games are survival horror as well. I realise this. But I love watching practically everything created by Tim Burton and Joss Whedon. These games allowed me to become part of the world’s they had created. I’ve completed both games, so many times. But I will play them over and over again. Simply because they don’t get boring. This Buffy game is the best one becuase I get to play different characters. Although, Sid the Dummy is at a disadvantage, height-wise. Strange little thing. Whereas you only play Jack Skellington in Nightmare Before Christmas. But, lets be honest, would you really want to play as anyone else. As you can see from the picture above, the one game I haven’t mentioned yet is Need for Speed: Underground 2. As far as I’m concerned, this is the best game on the Need for Speed series. I do enjoy a good racing game and for me, this is it. Not only do I get to take part in drag, sprint, circuit and drift races, but I can modify the cars. Give them the proper street racer look and increase the car’s visual rating. I couldn’t do this to an actual car, but give me a virtual one I’m going to have some fun. I’ve got some other games with me including Sonic Gems, Capcom Classics, Micro Machines, GTA Vice City and Lego Batman (See, not just one type of game). I’ll be honest. I can’t wait play these games and pretend reality doesn’t exsit for one whole week. Have fun gaming. Since I’m still trying to complete Spider-Man on PS4 (that thing called work is rudely getting in the way), I thought I’d look at some of the other Marvel superhero games I’ve played over the years. To be fair, there have been quite a few that I’ve played, So I’ve managed to round it down to my favourite five. This was one of the first superhero games I played. The main plot was to rescue Mary-Jane from the clutches of Mysterio. It was up to Spider-Man to infiltrate Rockwell movie studios and stop Mysterio’s plans. This game is where I got a taste for puzzle games. Since it was a platform/puzzle solving game. It also had the typical enemies to beat up, but it really made me think. Now, I know what you’re going to say. Why is this in the top five? Yes, the game had more bugs than a hot summers night and the controls weren’t exactly precise. Not to mention, it didn’t have the best graphics. But I really enjoyed being able to switch between Mr. Fantastic, Invisible Woman, Human Torch and the Thing. And using their special powers to defeat enemies and remove obstacles. I’ll be honest, it’s not a game I’d recommend. But, if you’re fanatical about Marvel, it’s really worth a try. This wasn’t too bad, the web-slinging between the buildings was pretty good. While outdoors, I stayed mainly on roof tops. I couldn’t get to the street level on this game. But it wasn’t really a problem. When playing indoor levels, the combat system was good. There were a number combo’s that could be used and a few web attacks that were fun to use. There were more boss fights than I really wanted. But, overall, it was fab game to play. Bearing in mind this game wasn’t for children. Mainly because of the crude words, sexual innuendos and the gore. But if you’re a fan of Deadpool, like me, you’ll love this game. The story, well, there really is no story. Which is just so Deadpool. The game play was fun. Especially with the choice of weapons, with a flair for the hack and slash. The teleport function was a good part of the game, and is implemented very well during the fights. Deadpool spends most of his time going on a tangent. So I was often thinking, what is Deadpool doing now. Which was actually more fun than annoying. This game is probably one of my favourites. Mainly because its Lego. I mean, come on, who doesn’t like Lego. But also because of the amount of superheros and villains you can portray. The game play is very simple, but effective. To complete all the levels, certain characters have to be unlocked. So there is a lot of replaying levels in this game. This game is great if you’ve had a hard day and you just want to chill. It’s lots of fun to play and hours will go by before you realise how long you’ve been playing it for. It won’t be long till the the last instalment of the reboot trilogy comes out. Tomb Raider – Shadow of the Tomb Raiser is released 14th September 2018. This game sees Lara in South America, where she faces Trinity and, of course, her own demons. From what I can tell, this is promising to be one of the hardest games in the trilogy. Once again, like the previous two games, Lara will have her trusty bow by her side. Don’t get me wrong, it’s kinda strange seeing Lara without her dual pistols. But I’ve got quite fond of using a bow and arrow. So, for this blog I thought I’d run through my top five Tomb Raider games. It was difficult just choosing five of them, since Tomb Raider has always been one of my favourite game franchises. Right up there with Uncharted and Assassin’s Creed. There is something about playing an action-adventure game, with puzzles that really make you think, that I find difficult to put down. I have to see how they end. Of course, the first choice is the first game in this iconic franchise. This action-adventure game was released in 1996. It was published by Eidos interactive and developed by Core Design. It could arguably be seen as one of the greatest video games ever made. I played the game when it first came out and I’d find it difficult not to agree. Not only was it fun to guide Lara through different tombs, while using her duel pistols to fend off wild animals and bad guys. The main excitement came from solving the puzzles and exploring the different surroundings in each level. At the time, the buttons used to move Lara and the way she moved around with the camera was quite cutting edge. However, I decided to dust the game off and pop it in my PS1 and have another go at it. How I coped with the movement and that camera is beyond me. As fantastic as this game is, I do believe I’ve been spoiled with how amazing the game play of the games of today is. They just flow so much easier. So, I suppose this game could be seen as the big sister of today’s games. I decided on this for my second choice. The Last Revelation was released 1999 and was the forth instalment in the game series. In this game, Lara’s movement and game play improved from the first game. When playing Lara, I could make her jump large gaps by using ropes dangling from the ceiling. Climb down and up poles and ropes. As well as, being able to shimmy around corners. Lara, herself, has been given a make over in this game. She has a more refined look, making her more realistic. The inventory also has a ‘combine’ choice for some of the items. Which means I could create a a whole new item. I know it doesn’t seem like much, now. But, at the time, it was a really major thing. I mean, being able to combine a large revolver with a laser sight was kinda epic. Tomb Raider: The Last Revelation, in my opinion, was a huge turning point in the franchise. My third choice is Tomb Raider: Legend, which came out in 2006 and was the seventh instalment in the game series. It saw the game franchise go back to its true form. The game showed an increase in Lara’s abilities. Giving the player more freedom of movement with Lara. She can still jump, climb, shimmy, swing on ropes and use vertical poles. But she can crawl through small spaces and use a grappling line to pass over gaps and pull different objects towards her. In a few of the levels, Lara is riding a motorbike and fighting enemies in the process. Which, for me, was one of the best parts of the game. The puzzles are much more intricate. especially since they block the players progress, if unsolved. Tomb Raider: Legend was definitely a step in the right direction in the franchise. I know, before you say it, Tomb Raider: Underworld wasn’t one of the best games in the Tomb Raider franchise. It was released in 2008 and was the eighth instalment in the game series. The combat system and camera angles are something to be desired. But the story and exploration was really good. Even the puzzles made you stop and think at times. In this game, Lara’s interaction with the environment much more realistic. When exploring, Lara is able to push parts of her surroundings out of her way. Her foot prints are left behind as she walks through the mud. The weather has more of a realistic impact on Lara. Except when she’s climbing or shimmying in the rain. The natural thing is to slip of have difficulty holding on. But Lara seems to cope with this fine. In my personal opinion, Tomb Raider: underworld may not have been the best game, but it is brilliant to play. If you’re like me. Once I started, I couldn’t stop. My fifth choice is Tomb Raider, which was released in 2013 and was the tenth instalment in the franchise. However, this game was the start of yet another reboot of the series. In this game Lara was much younger than in her previous games. This was before she became the Tomb Raider we know and love. What we have in this game is an untested Lara, who has never seen battle. The player journey’s with Lara as she learns how to escape a cult who’s hunting her down and doing whatever it takes to save her friends. As a result, this game focuses on survival more than exploration. The game play is much better than any other Tomb Raider game that came before it. Rather than just attacking and shooting enemies, stealth kills and close-quarter combat is much more favourable. The stealth kills are a great way to progress through the levels when Lara is just getting to grips with having to kill for survival. This game see’s Lara using a bow, rather than the dual pistols. It also has a survival instinct, similar the Assassin’s Creed eagle eye. It aids in solving environmental puzzles and where to head next, to progress in the game. Tomb Raider sees the player gain xp, to develop Lara’s survival and combat abilities, as well as, collecting crafting materials to upgrade her weapons. The game also has a multiplayer mode for online gaming. I’ve played the multiplayer mode quite a lot and it really is a lot of fun. Tomb Raider is a fantastic reboot of the series and can easily stand by side with the best of the games out there. This is the question I’ve been asking myself the past week. Why didn’t I get this game when it came out? Everybody’s golf was developed by Clap Hanz and SIE Japan Studio, it came out in August 2017. When I first saw it, I remember thinking ‘that looks a good game, I must buy it’. Did I buy it? No. Why, u ask? I’m still working on that answer. It wasn’t until I had a glance in the PS store and saw it in offer, I decided to buy it. What I don’t understand is, I really enjoy playing golf. Whether it’s on a crazy golf course or as a video game. So, there is no good reason it took me so long to get it. And now I can’t stop playing it. It’s so easy to play and addictive, as I’ve found out. In order to hit the golf ball, all it takes is a three-click swing action. Just click X three times to get the desired distance and power. Of course, as time goes on, there are other things that have to be considered when teeing off. Such as, the wind direction and strength. What the weather’s doing and what type of terrain the ball has landed on. It’s also easy to get used to the camera controls and how to use the targeting map to your advantage. I’ll be honest, my favourite part is creating the avatar. I always go for a goth look. Obviously I try to make it similar to myself. But, lets face it, we all make the changes we wish we had to the avatar. I had the basics to start with and was able to make a suitable black clothed avatar. Even though I’ve gone up in the levels and gained a lot more items for my avatar, I haven’t changed her much. I’ve always preferred the simple look. The game also gives more than just the general male or female choice. I could make a child avatar or an elderly avatar. Which is great. But, when you see the child characters play during the tournaments, the golf club looks too big for them. Which is pretty funny (sorry, daft sense of humour). It’s relatively easy to rise up the levels. The ranks on the other hand, that’s a different matter. The quickest way to gain exp, is to win the tournaments. Every time I gain enough exp, I face off against a rank boss. There have been three in total. The last one being the big boss and the only way to rank up is to defeat that boss. I won’t lie, if you haven’t figured out how to get high scores during the tournaments, there’s a good chance you’ll struggle with the big boss. They really put me through my paces. The ‘Home’ area of the game can be quite fun. It’s an open section, so it’s easy to run around and explore. Unless, you’ve defeated the right person and them you can drive around the ‘Home’ area in a caddy. There are a lot of other characters in this area. A few of them can be interacted with and I do recommend this. As some of them can give you some hints and tips to make your game better. The game also offers online play. Whether you choose an open course or turf war. It’s a great way to interact with other players. It also means playing against people who can do more than put you through your paces. But, if your after a challenge, it’s definitely worth a try. Yes, I’m kinda obsessed with this game. I’m still playing it now. In fact, as soon as I finish this blog, I’m going back on it. It’s a fun game to rest and wind down with, especially after a hard day at work. Everybody’s Golf probably has some negative points to the game and I probably don’t see them, because I don’t want to. It’s fun, it’s quirky, it’s definitely my kind of game.